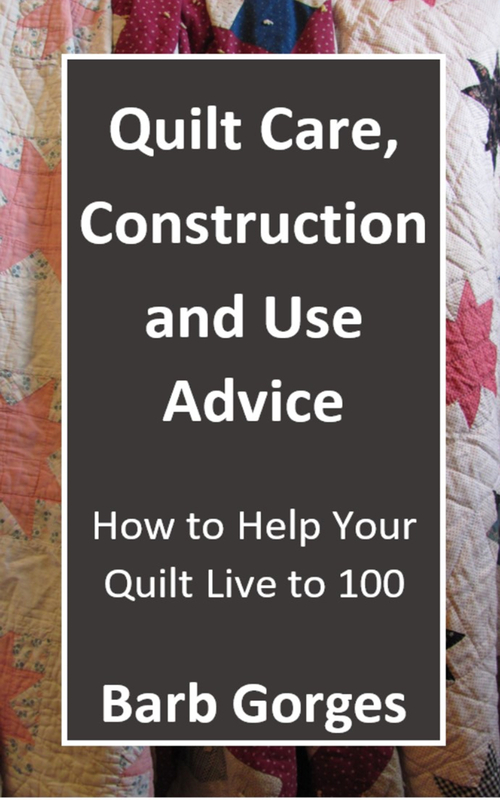 My classes on quilt care and the previous blog posts referred only to “How to Help Your Quilt Live to 100.” That’s a title that would stand out in a quilt shop. But in a book shop with over 200,000 other titles, the most important words needed to be up front. To find the book, go to Amazon.com and search for either “Quilt Care” or “Barb Gorges.” It’s a mere $5.95 investment. The original blog posts have been reorganized and include additional information. If you buy a copy now, you can share it for up to 14 days–that could help save a few more quilts from unnecessary hardship! And while you are there, feel free to write a review. However, if you find any mistakes, please let me know by email, bgorges4@msn.com. The beauty of the digital format is that I can edit and improve the book anytime—and the updates will show up on your device. I hope to have the paperback version formatted and offered on Amazon later this summer. It’s a matter of figuring out how to get unfamiliar software to play with familiar programs. Spread the good word—save a quilt! A queen-sized quilt with cotton batting will easily fit a 12 x 12 x 9-inch box if folded like an accordion (or a map), first in one direction and then the other. Photo by Barb Gorges. In the previous two columns, I discussed appraising a quilt’s value and insuring it. It is especially important to take care of these two items before shipping a major quilt. If the quilt is valued for more than the maximum the shipping company can insure, make up the difference with a temporary insurance policy, especially if the quilt is going to a show. When shipping to a quilt show, be sure to follow their directions exactly. The major shows have instructions that help them receive and track quilt entries and return them. If you are shipping a quilt as a gift to someone, don’t surprise them. Double check their address. Find out which carrier they trust the most. Find out if they will be home. Find out if it would be best to ship the quilt to your recipient’s work place or their home or some other location where they trust someone to receive it. You might pay extra for a signature to be required when the package is delivered. In some locations, packages can be picked up from UPS rather than left on a doorstep. Once you ship the quilt, send the recipient the online tracking information, though if anything goes wrong, you will still be the only one allowed to make inquiries. If you used a shipping service like The UPS Store, they make the inquiries. If your quilt is a wall hanging, avoid creases by wrapping it around a swim noodle or cardboard roll. If folding, fold it like an accordion, wide enough to fit the box one way and then accordion fold to fit in the other direction. Pin a copy of the mailing label to the quilt. Place the quilt inside a plastic bag—clear if possible. Place in the box. A new box is safest because it is stronger than a used box. Consider double-boxing to protect the quilt better from punctures. If there is any space left in the box, consider cutting the box down to make the quilt fit exactly or fill the empty space with Styrofoam chunks (avoid the aggravation of peanuts or at least put them in plastic bags) or closed egg cartons. Use a black marker to cover any printing on the box. Use plenty of packing tape. Put clear packing tape over the mailing label to protect it. Avoid writing the word “quilt” anywhere on the box. When filling out the company’s insurance form, refer to your contents as a textile, which is not as exciting to would-be thieves but still describes a quilt. Don’t wait for your quilt’s new owner to send you a thank you note. Once the tracking information shows that the quilt has been delivered, double check that it was delivered to them—and not their neighbor. If your quilt is delayed by more than a few days or appears to be lost, contact the shipping company and be prepared to give them a copy of the documentation that shows the value of your quilt. Check http://lostquilt.com for more suggestions.